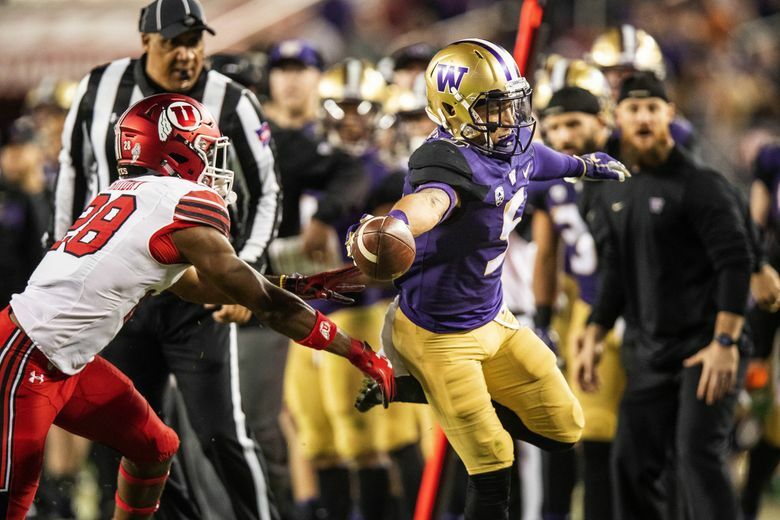 Can blazing Washington wideout Andre Baccellia improve on a breakout Rose Bowl in 2019? Andre Baccellia has a clock tattooed onto the outside of his right forearm. After all, the redshirt senior wide receiver set some stopwatches ablaze at the Husky Combine on Friday, notching a 4.38-second 40-yard dash that finished second on the team, behind only running back Salvon Ahmed (4.32 seconds). That number marked a .01-second improvement over Baccellia’s 40 at the same event last spring. The goal was to deliver the same speed in a different package. Baccellia — who is listed at 5-foot-10 and 173 pounds — may have been a “little light,” but that didn’t impact his bottom line. The Thousand Oaks, Calif., native enjoyed the most consistent success of his career at the end of the 2018 season. He piled up five catches for 89 yards in a snowy Apple Cup win over Washington State, then added eight more catches for 65 yards en route to being named the Huskies’ offensive player of the game by his coaches in the Pac-12 championship win over Utah. Baccellia literally saved his best for last, setting a UW bowl-game record for receptions with 12 catches for 109 yards in the Rose Bowl loss to Ohio State. It would be reasonable to expect another leap in Baccellia’s redshirt senior season, particularly with strong-armed transfer quarterback Jacob Eason setting up under center. But what are his expectations for the wide receiver room as a whole? It’s Junior Adams’ job to deliver those results. Washington’s first-year wide-receivers coach made an immediate impact after being hired in January, helping the Huskies land four-star wideout and former USC commit Puka Nacua in the 2019 class. But can the former Western Kentucky offensive coordinator and longtime wide-receivers coach help transform an underperforming unit? Can he further develop the team’s top three receivers from 2018 — senior Aaron Fuller, Baccellia and junior Ty Jones — all of whom return this fall? Can he maximize the potential of talented underclassmen like sophomore Terrell Bynum — who finished fourth in both the 40-yard dash (4.48 seconds) and the pro agility drill (3.92 seconds), by the way — and redshirt freshmen Marquis Spiker and Austin Osborne? Can he unleash enigmatic senior Chico McClatcher? Those answers are coming, starting in September. For now, Adams and his new pupils are still making introductions. Of course, it would be understandable if Baccellia — who has compiled 78 catches for 869 yards and one touchdown in 36 career games — was not so excited to embrace his fourth wide-receivers coach in four-plus seasons in Seattle. But the rotating door hasn’t resulted in any lack of buy-in. Thus far, Baccellia has proven to be a fast learner. Better yet, he’s just fast.